This giveaway is closed. Congrats to Amy Lauren on winning the gift card! I grew up going to Captain D’s on Sundays after church. It was in regular rotation with several other small town restaurants in my hometown just outside of Nashville. Since then Captain D’s has changed with the times. Not only have they completely refreshed their store design, both inside and out, but they have introduced several healthy grilled items to meet consumer demand for lighter and leaner protein. Seriously, if you haven’t been into a Captain D’s in a while you are in for a pleasant surprise. It’s tough to find healthy and fast dining options for kids. We are always on the go and between track practice, band events and all the other usual school and work to dos on our calendars, it’s nice to have something other than predictable burgers and fries in our neighborhood. 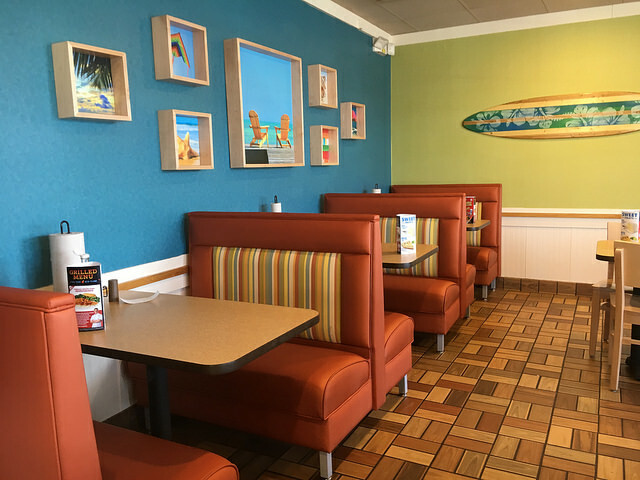 Captain D’s reached out to me recently to try out their new menu and check out their new look, which reminds me of a beach resort getaway and NOT a restaurant chain. I’m a huge beach lover so anything that reminds me of the beach in land-locked Nashville is a great thing! This is my neighborhood Captain D’s restaurant dining area. Seriously, does this look like the Captain D’s you grew up going to with your family? No fish nets or hokey oars on the wall. I recently grabbed lunch to go on a work break at Captain D’s. The grilled shrimp skewers are delicious! This is a $7.99 meal, which is a much better alternative than a burger combo. If you haven’t given Captain D’s a try in a while, I’d definitely recommend it for families. Their kids’ meals also include a grilled fish option, as well as the traditional battered and fried fish which is still one of my favorite menu items. Captain D’s is a participant in the Kids LiveWell program, which features restaurants that offer healthier menu choices for parents and children. Would you like to win a $25 gift card to Captain D’s? Simply leave a comment on this blog post telling me what your favorite menu item is at Captain D’s OR if you have never tried Captain D’s what menu item you’d like to try. I’ve got to go back to try the new strawberry limeade and crab cakes just added to the spring menu lineup. Giveaway ends midnight Sunday, April 24. Disclosure: I received free passes to tour The Hermitage. This entry was posted in Reviews & Giveaways and tagged Captain D's, giveaway. I was invited to a Captain D’s tasting event and was pleasantly surprised by the crab cakes! I was glad to see so many grilled options on the menu last time (yes, after church!). I’d love to win! Those shrimp skewers look delicious and I’d love to try the sweet potatoes. I usually get the fried shrimp and broccoli when I go to Captain D’s. Good to know they have some healthier options now. I’ve only ever had the battered fish and it was pretty good. 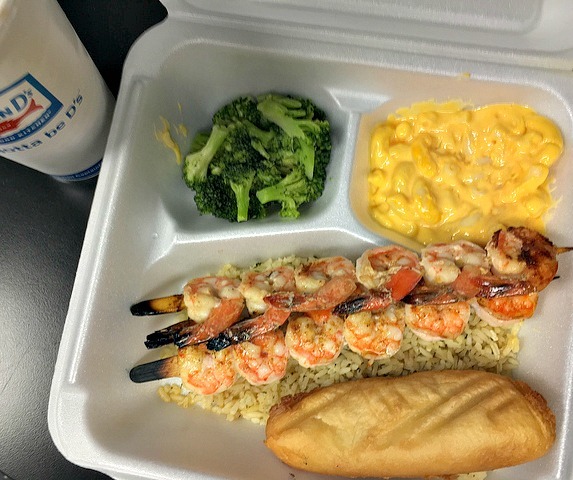 But that shrimp skewer looks great. My kid love shrimp. Those shrimp skewers look great. I’d like to try them! My family loves Captain D’s. My daughter would eat the shrimp all day!